Accountants and financial managers are often the first professionals to realize that a financial problem exists within a corporation but must be familiar with the various alternatives available before they can offer solutions. 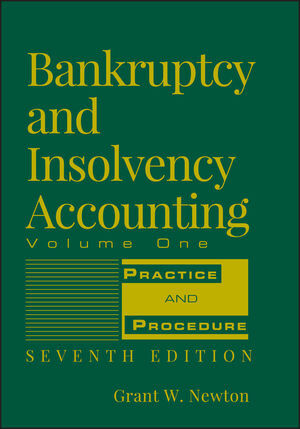 Completely updated, Bankruptcy and Insolvency Accounting, Seventh Edition, Two-Volume Set provides easy-to-follow, real-life examples with coverage of the Bankruptcy Abuse Prevention and Consumer Protection Act of 2005, and updated legislation and practice changes due to Sarbanes-Oxley. The process of corporate restructuring is thoroughly described for controllers, CEOs, CFOs and CPAs with small businesses as clients. 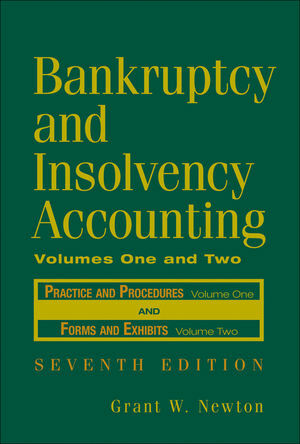 Grant W. Newton, CPA, CIRA, CMA, is Professor of Accounting at the Graziadio School of Business and Management at Pepperdine University and is Executive Director of the Association of Insolvency and Restructuring Advisors. 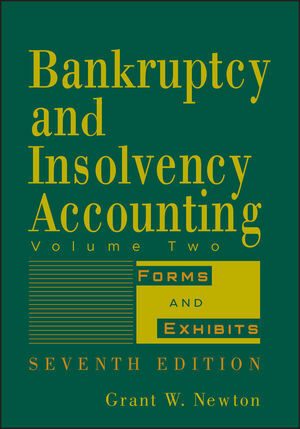 He is the author of Corporate Bankruptcy: Tools, Strategies, and Alternatives (2003) and Bankruptcy and Insolvency Taxation (2005), both from Wiley. His articles have appeared in a large number of professional periodicals. He received his PhD from New York University, Master's from the University of Alabama, and BS from the University of North Alabama.